As the future for the TransCanada pipelines remain up in the air, many environmentalists and First Nations communities worry about the decision the Liberal government will make for this project. Current Concordia student and leader of the Green Party of Quebec discusses the environmental risk that TransCanada pipelines impose. Photo by Marie-Pierre Savard. 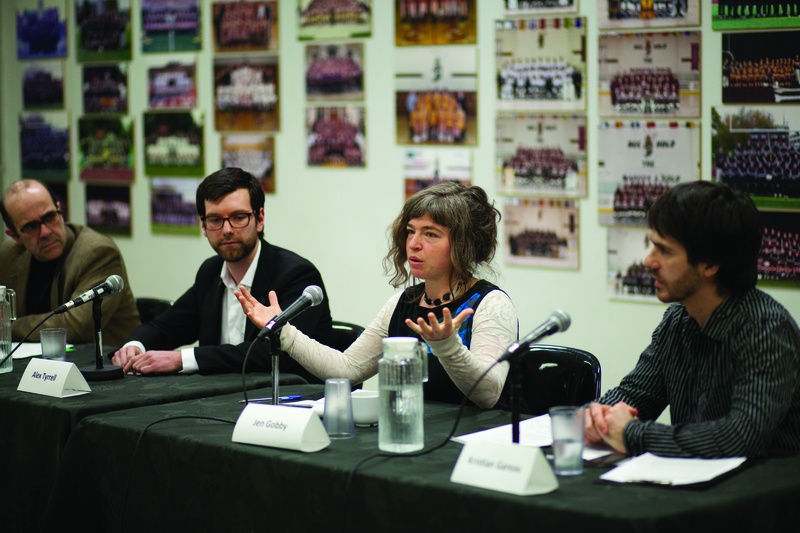 On Feb. 9, the School of Community and Public affairs at Concordia held a panel addressing environmental concerns regarding Canada’s energy sector. The panel included Alex Tyrrell, leader for the Green Party of Quebec and a current Concordia environmental science student; Jen Gobby, the founder of Mud Girls, a natural building collective of women who use local, natural and recycled materials in the west coast of B.C. ; and Kristian Gareau, a Concordia graduate student and member of Climate Justice Montreal. Political science professor Daniel Salée opened the talk by presenting the arguments pro-pipeliners have shared. Pro-pipeline arguments claim the TransCanada pipeline is crucial to transport oil to refineries and markets across the country, insisting this model is the safest transportation system and that the pipelines will benefit the economy through creating jobs. In contrast, many communities—including those living on Indigenous land—will be affected, and worry about the complications the community may face, including environmental damage. Gobby said it is vital to take a stand against the threat of environmental degradation imposed by these projects, following in the steps of First Nations who successfully blocked development on their lands under the Harper government because of the environmental risks of the project. Mediator Daniel Salée questions the panelists on their aspirations towards defending Canada’s environment from the pipelines project. Photo by Marie-Pierre Savard. “You can say arguably that many of these pipelines would have been built by now if [environmental activists and First Nations] hadn’t been actively reinhabiting their land and bringing supporters from all over the country and all over the world to stand with them,” Gobby said. “These are ways that … we are seeing the ability for voices to be heard and decisions to be made outside the process.” Gobby hopes these voices will inflict more pressure on the government to develop more concern for the environment. “There are ample opportunities for people who want to support Indigenous resistance efforts to ally and to support,” she added. Tyrrell spoke of the progress that has recently been made towards the climate—locally and globally—with some Quebec politicians moving towards environmental change. For example, Tyrrell said Quebec Premier Philippe Couillard hasspoken out against hydraulic fracturing on Anticosti Island, which is located in the Gulf of the St. Lawrence. Recently Montreal Mayor Denis Coderre, along with other mayors in the Montreal area, publicly announced they would reject pipelines. “Although many people might have said that it’s an issue of Quebec vs. the rest of the country—that’s definitely an argument I can definitely and completely disagree with,” Tyrrell said. “The fact of the matter is that there are people who both support and oppose the Energy East pipelines in all provinces.” The city of Vancouver just recently opposed the Trans Mountain pipeline due to environmental threat, he added. The panel suggests that implementing more pressure on political powers is critical for seeing environmental change. Photo by Marie-Pierre Savard. Rebutting the pro-pipelines defence for development to the economy, Tyrrell said that TransCanada has said there would only be 33 permanent jobs after the construction of the pipeline is complete. “Taking those kind of environmental risks to employ a small handful of people is not a very wise decision,” Tyrrell said. The Concordian previously quoted Kristian Gareau as saying “Resistance can be very creative and very futile,” when in fact he said ““Resistance can be very creative and very fertile.” The misquote has been changed. The Concordian regrets the error.